One of the most boggling experiences I have is standing on a beach staring at the ocean. It’s just a silly amount of water. And then there’s all this water underground, and more in the atmosphere, and there are lakes and rivers and streams and marshes and swamps and snow and glaciers and ponds and puddles. I need to cube it. 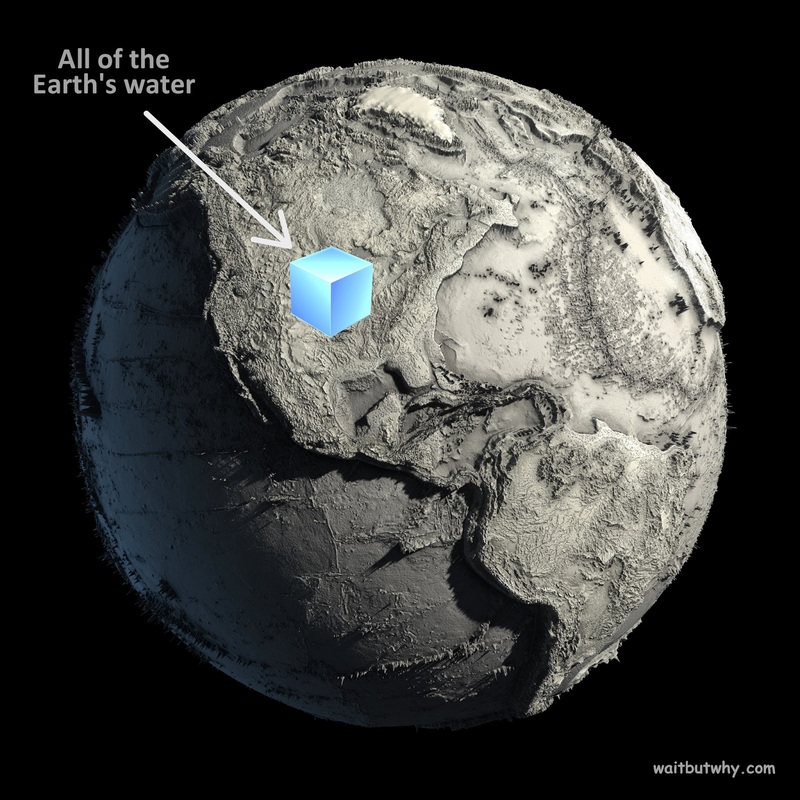 I need to put all the world’s water in cubes so I can look at it all at once and grasp how much there really is. It’s only fair. 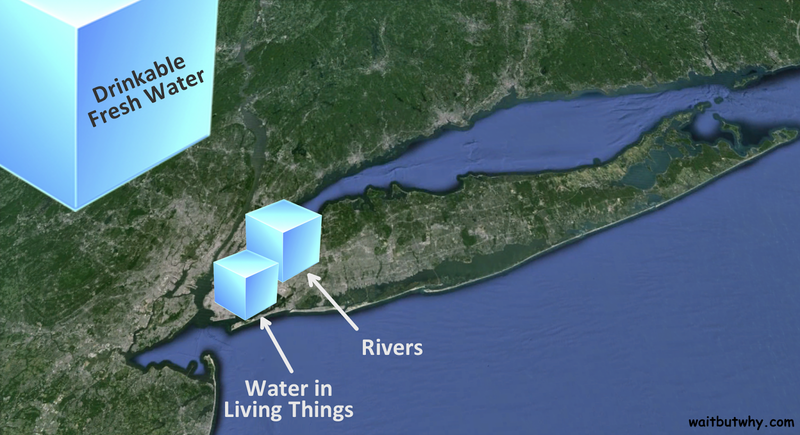 Okay so almost all of the Earth’s water—over 97%—is sitting there in the oceans. 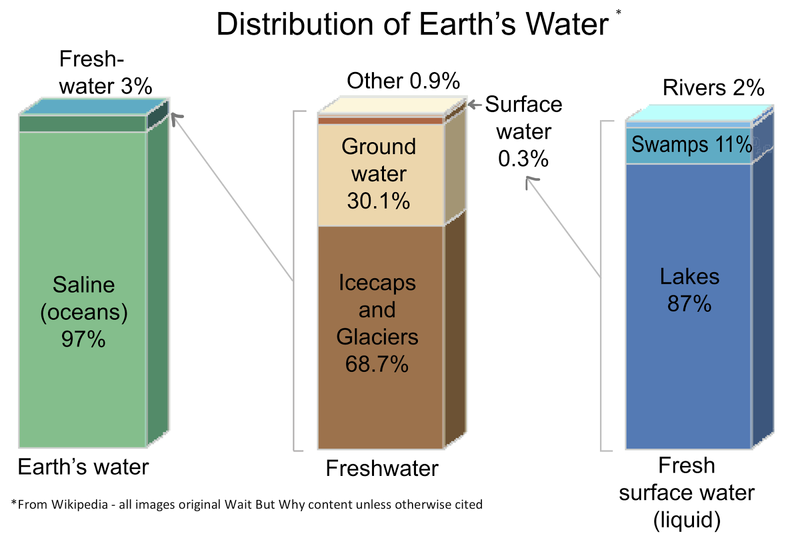 This isn’t hugely surprising, but what did interest me is that of the 3% of all the water that’s fresh water, only .3% (or 3/1000ths) of that is the kind of fresh water we know well—lakes, rivers, and other surface water that humans and most other animals drink. 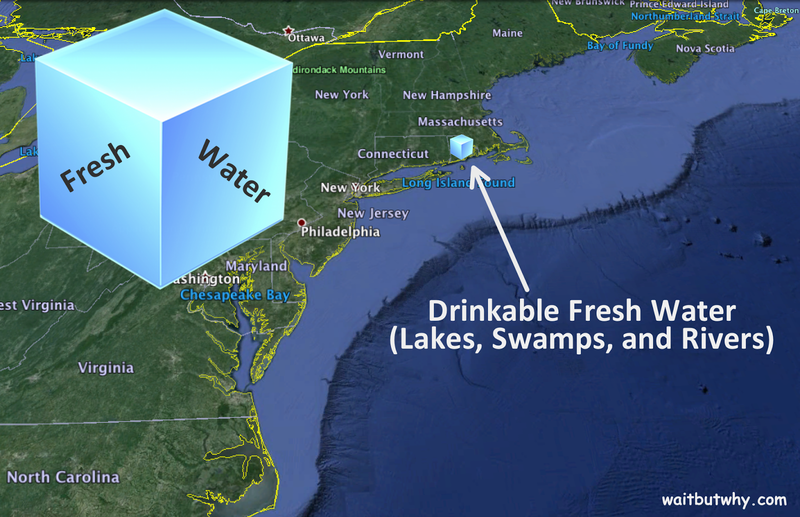 The rest of the fresh water—99.7% of it—is icecaps and glaciers, underground water, and water floating in the atmosphere. In fact, all the lakes in the world amount to only about 1/250th of the amount of water in glaciers and icecaps. 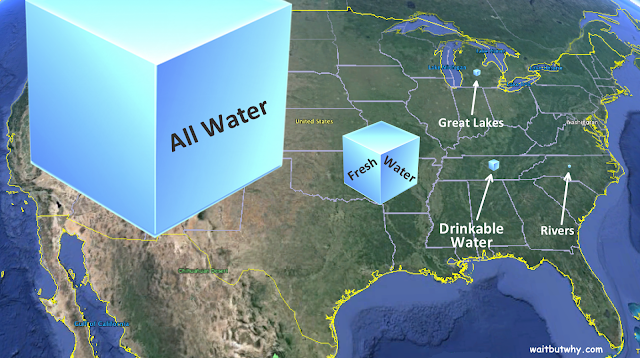 So anyway, if you took all of that water and put it into a huge cube, how big would the cube be? Below, see the Earth with the water in all the normal places, and then we’ll strip all the water and put it into a cube on top of the US. There you have it. 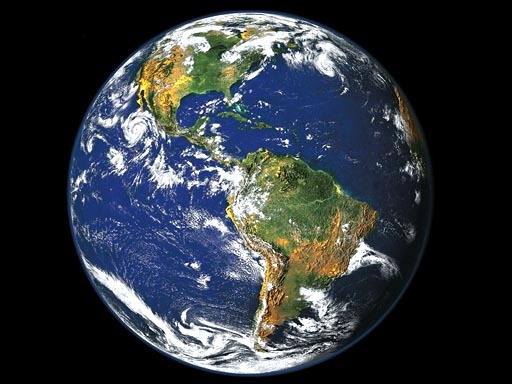 All the water underground, on the surface, and in the atmosphere amounts to about 332 million cubic miles. That makes a cube with a side of 693 miles, whose base stretches from Indianapolis to Denver. It doesn’t feel like you could even fill the Pacific with the water in that cube, let alone everything else. So I guess the big takeaway here is that the Earth’s oceans are nothing more than a thin film on the surface of the Earth, relatively speaking. And how big would a cube of just the fresh water be? It would have sides 202 miles long and sit nicely on top of Iowa. And the drinkable water cube? Its sides would be 29 miles long and it would fit into Rhode Island. 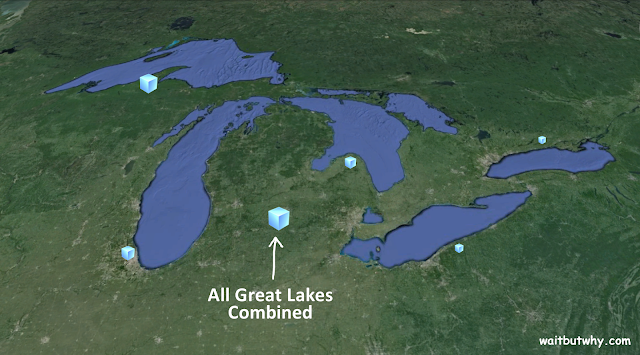 It blew my mind that all the world’s lakes and rivers would fit into that cube. And that’s the drinking water that all animals have to share. 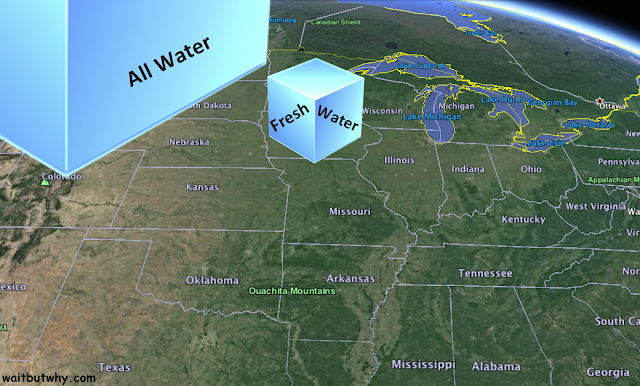 Within this cube of drinking water, you could cut out a smaller cube (8 mile sides) that contains all the rivers, streams, and brooks on Earth—the Amazon, the Mississippi, the Nile and all the rest—and another (6.5 mile sides) that contains all water inside of all of Earth’s living things. These would sit comfortably on top of Queens and Brooklyn.